F- PLUS is a violin, clarinet and percussion trio committed to collaborating with today’s most exciting composers to establish a diverse repertoire for their unique instrumentation. 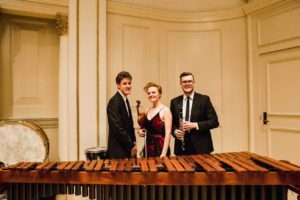 Formed in 2016 at the Bang on a Can Summer Festival, the ensemble has commissioned over 20 new works and has performed all over the country, from Carnegie Hall’s Weill Recital Hall in New York to the Art Institute of Chicago and the New Music Gathering in Boston.The 2018-2019 season includes performances in Chicago, IL at Constellation and the Poetry Foundation, in Detroit, MI and in Austin, TX, presented by Tetractys New Music. F-PLUS is committed to working with the next generation of composers, and looks forward to residencies at the Cincinnati College-Conservatory of Music, Illinois State University and University of Texas at Austin during the 2018-2019 season. The ensemble has previously completed residencies at Grand Valley State, Central Michigan, Stony Brook and Duke Universities.